It was back in 2009, when Ruth and Michael Green stopped to question the intense and relentless schedule that had become their norm. Balancing Ruth’s shift work as a paediatric nurse with Michael running his own surveying business, time spent together was a rare treat. So, in 2010, the Green family took the bold decision to sell up and relocate to the Isle of Wight in search of their next chapter. Purchasing a farm near Cowes they set about exploring the natural environment around them, learning what was available to forage from their hedgerows. In less than ten years, the couple have transformed their lives and created a successful business which was recently awarded Small Business of the Year. They now make and sell a core set of fourteen flavours, available online and at selected outlets. The company has expanded to employ two staff to help with production and is continually working on new flavours and product lines. “However large we get we will always keep Tipsy Wight as a family business,” explains Michael. We have created a business we are both extremely proud of and most importantly, believe in. 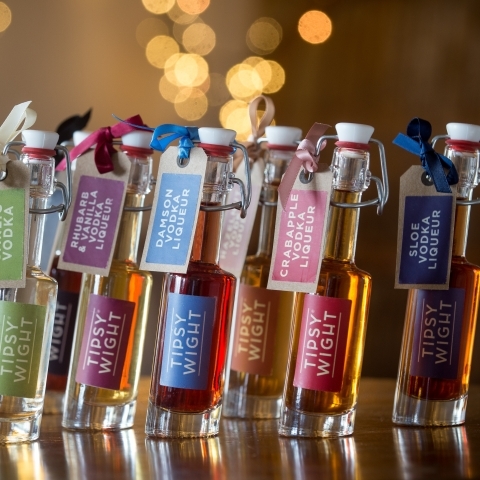 Tipsy Wight bottles, glasses and gift packs are available to buy online from their website and from Not on the High Street. Flavoured vodkas and liquers produced using 100% natural ingredients from the Isle of Wight.